Nikwax was the first company in the world to produce a range of water-based products for restoring waterproofing in the home. Not only did the products avoid emitting harmful solvents into the atmosphere, but they were also very easy to use, allowing people to reproof their clothes in a washing machine. The range of Nikwax products grew to encompass systems for a multitude of uses; from ropes to tents, indeed, almost anything that needed regular help to maintain its resistance to water. Order in the next 13 hours and 11 minutes and select "Next Day" at checkout. 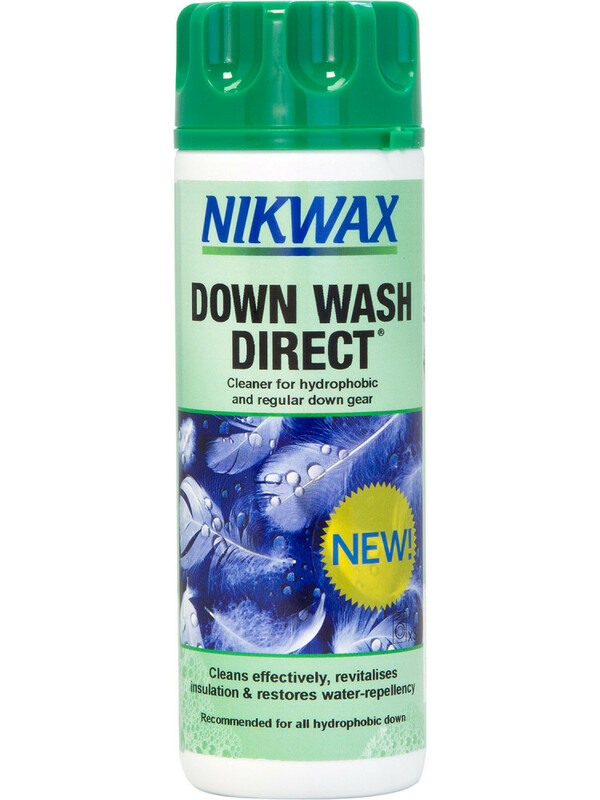 Nikwax Down Wash Direct has been specifically designed and optimised for down filled gear. It is a highly effective cleaner which removes body oils and dirt from both the fabric and the down fill. It also restores the Durable Water Repellency (DWR) of both the outer fabric and the down. This protects against rain and condensation, preventing the item from wetting out and maintaining the natural insulating properties of down. Additionally it revives breathability, allowing moisture vapour to pass through the item, optimising performance in cold and damp conditions. Sleeping bags and very large jackets are best hand washed in a bath or equivalent and then spin dried in a washing machine. Use neat Down Wash Direct to treat stubborn stains before washing. Remove all non-washable parts. Shake well before use. Follow care label instructions. Do not use conventional detergents. Remove all detergent build-up from the detergent dispenser. Place maximum 2 items in washing machine. Wash according to care label, preferably on low setting and slow spin. After the washing cycle has finished run multiple spin cycles, each time incrementally increasing the spin speed, to remove excess water.